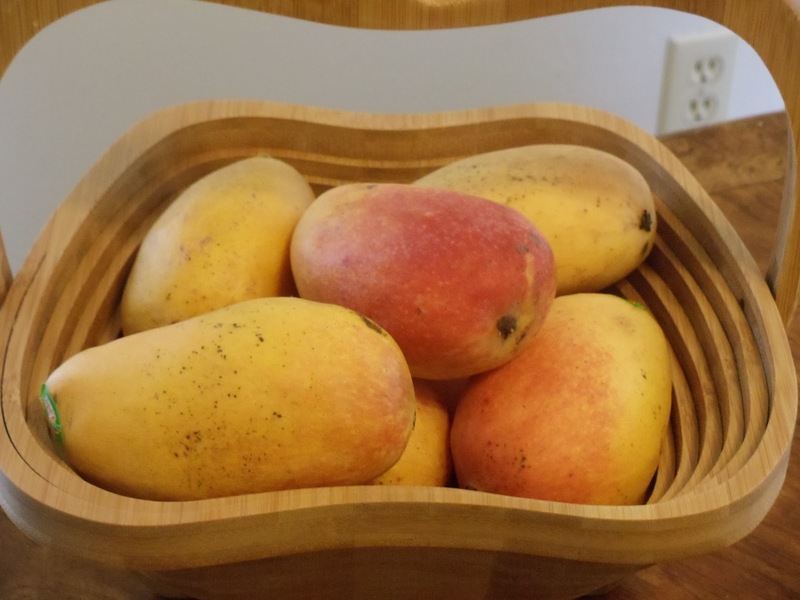 Remove the peel of the mangoes. Don't throw the peel. Now add little water to the peel and squeeze it properly to get the juice. Repeat this process twice so that there is sufficient juice to cook the mangoes. Take the peeled mangoes, the juice extracted and the green chillies ( cut it lengthwise) in a pan and bring to a boil. Add salt. Cook it for 15 minutes and now the color of the mango will slightly change. Add jaggery depending on how sweet you want. Continue cooking for 5 more minutes. Now take All purpose flour in a small bowl. 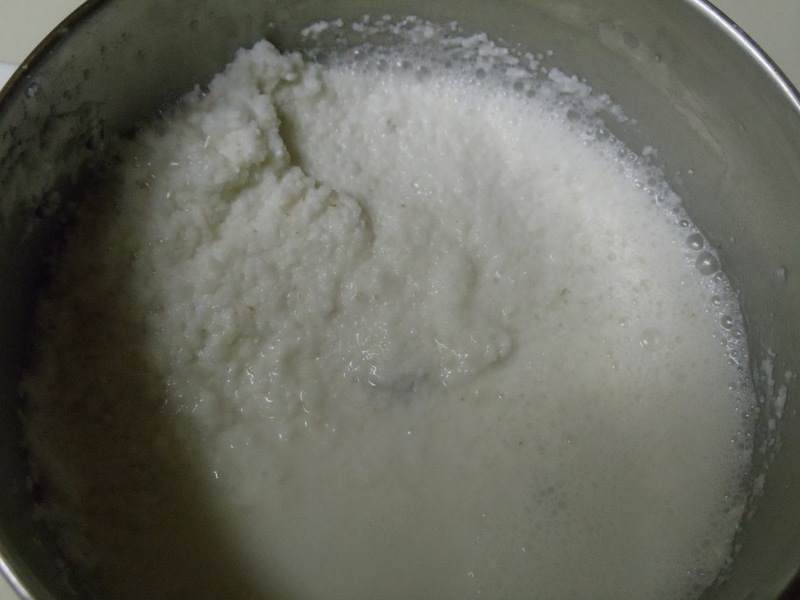 Add little water to it and make a thin paste without lumps. 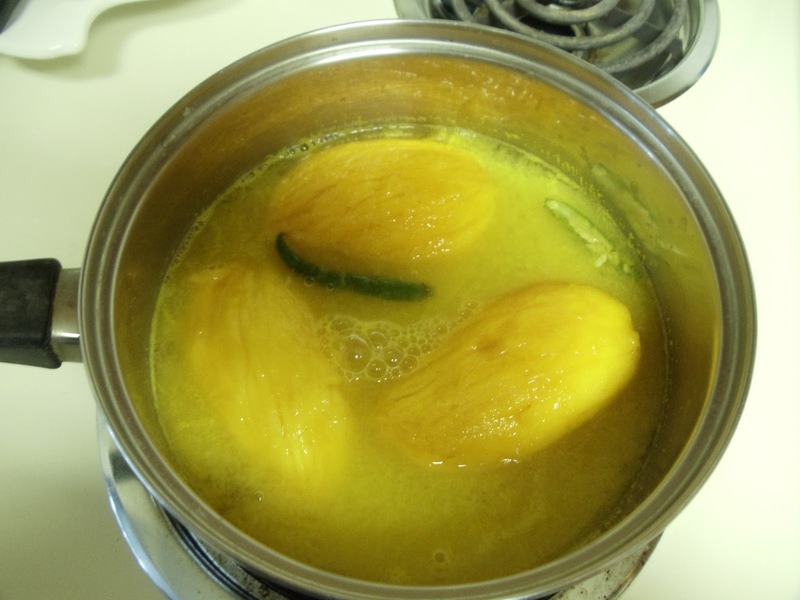 Add this paste to the cooked mangoes and cook it for 5 more minutes. Adding the maida paste will give thickness to this dish. Turn off the heat. 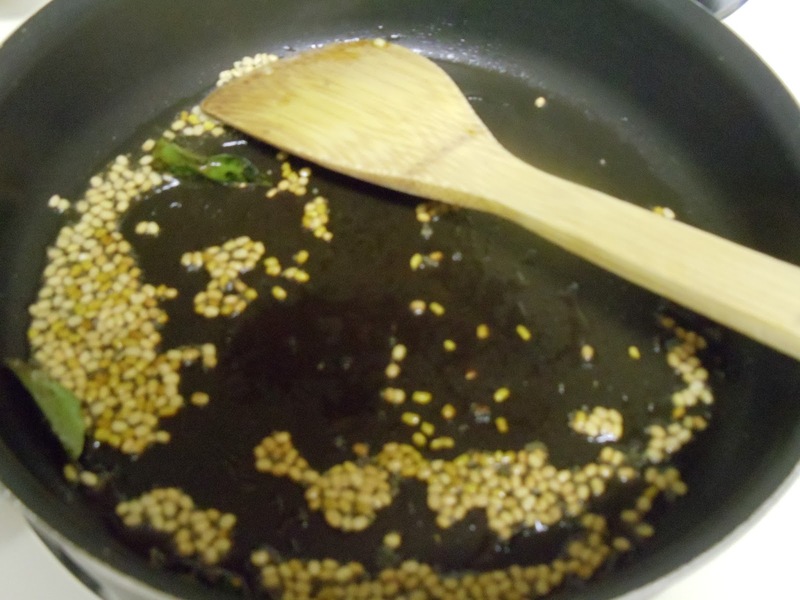 For seasoning the dish, heat oil and then add mustard seeds. 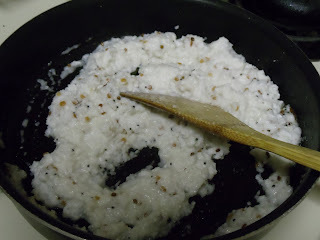 Once it starts spluttering, add urad dal. Fry for few seconds and then add red chilli and curry leaves. Ambe Upkari is ready!! 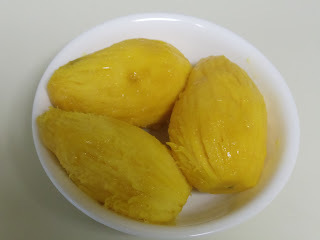 This dish is served as a side dish with rice or can be eaten independently. Above measurement serves two people. Undi is a very healthy and filling breakfast. Since it is steamed, it has less oil in it.The local people of Mangalore and Udupi also prepare this and in Tulu language they call Undi as Pundi. Pundi is also rice dumpling but without seasoning. Stories apart lets see how exactly its done. For steaming undis i used Pasta Steamer. 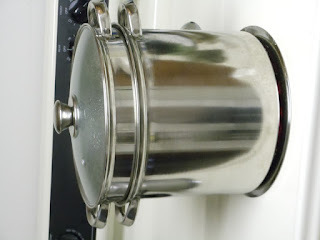 You can also use an idli cooker or a non electric traditional idli steamer. 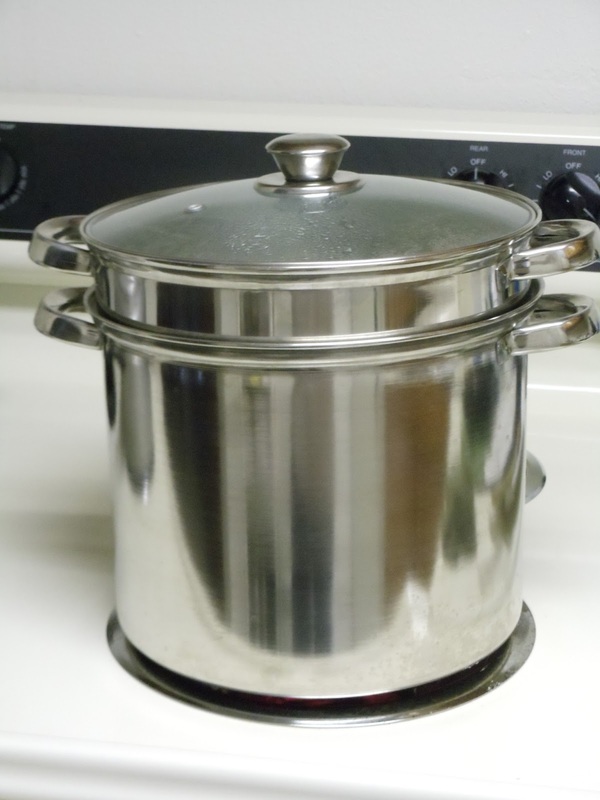 Soak rice in sufficient water for one hour. Then grind it adding little water (nearly 3/4 cup). Grinding the rice should be done very carefully. I gave just three pulses of few seconds. The rice grain should be coarse. If you feel it difficult, then you can use rice rava (use of rice rava makes the procedure simpler because it eliminates the process of grinding but remember to soak the rice rava for an hour). 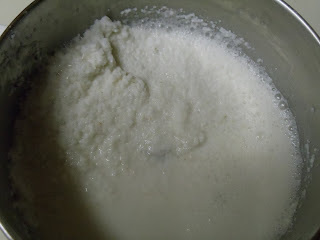 After grinding I got the mixture as shown in the picture. I transferred the rice rava in a bowl. To this I added salt and coconut. Now take a Kadai and add oil. When it gets heated add mustard seeds. 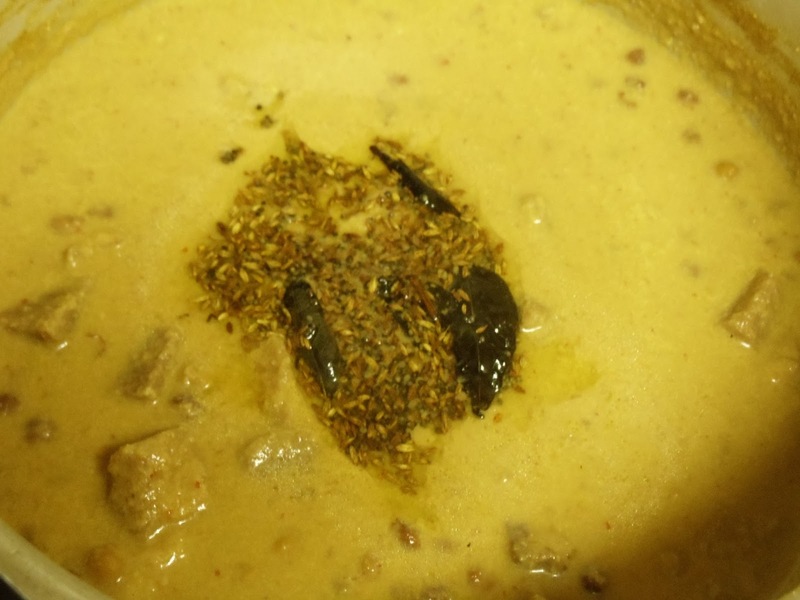 Once the mustard seeds starts spluttering add curry leaves, urad dal and methi seeds. Fry well until pale brown. Now add the rice and coconut mixture to the kadai. Stir well. Keep stirring until the water evaporates and it converts into a semi-dry mass. Then turn off the heat. Let the mass cool for a while (don't cool it completely because it may turn hard).Then apply little water on the hand and take small amount of the mass to make a small ball. Then make a slight depression anywhere on it as shown in the picture below. 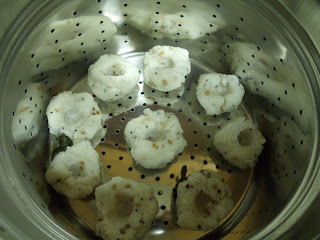 Keep the rice balls in the steamer and steam it for 15 minutes. Undi is ready!! 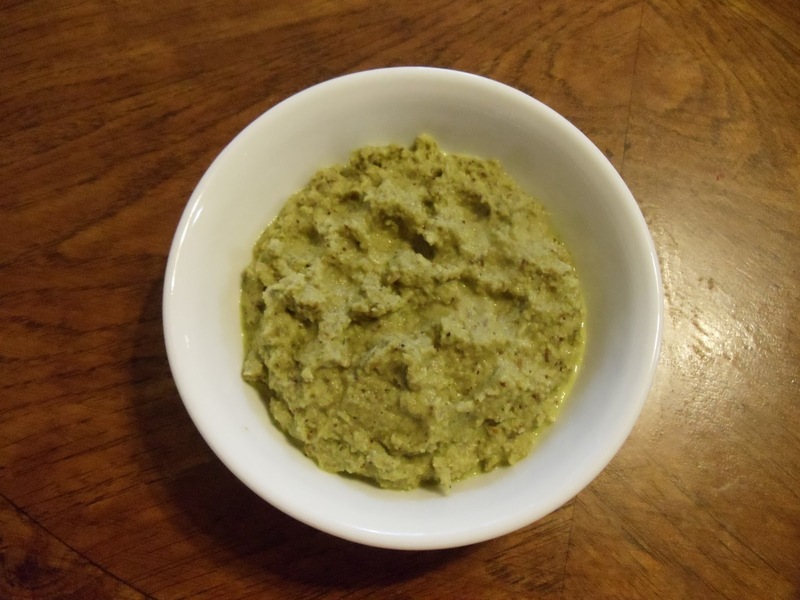 You can serve it with chutney,pickle, any curry of your choice or just coconut oil. This measurement serves for two people. 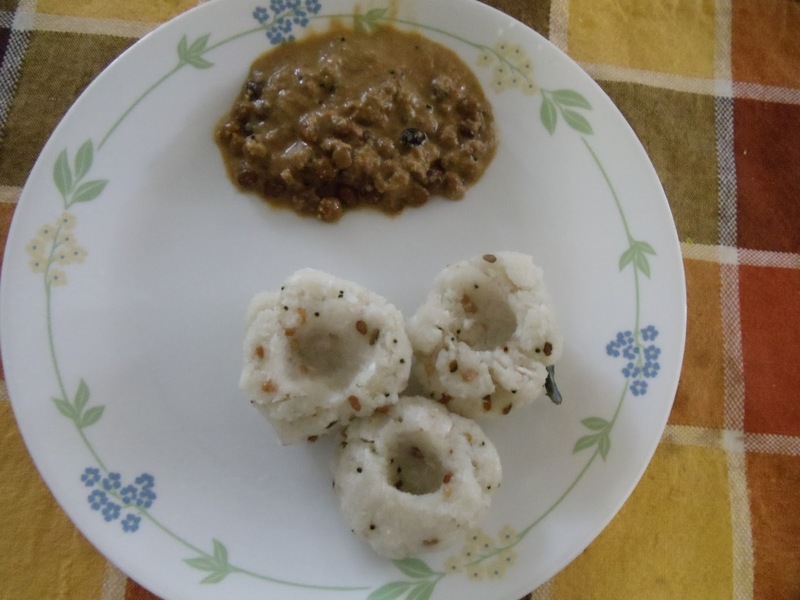 This is one of the popular breakfast in South Canara region. I have asked my Non - Konkani friend as to how they make neeru dose. The only difference between the Konkani and Non - Konkani neeru dose is Coconut. They don’t use coconut hence it comes crispier than what we do. 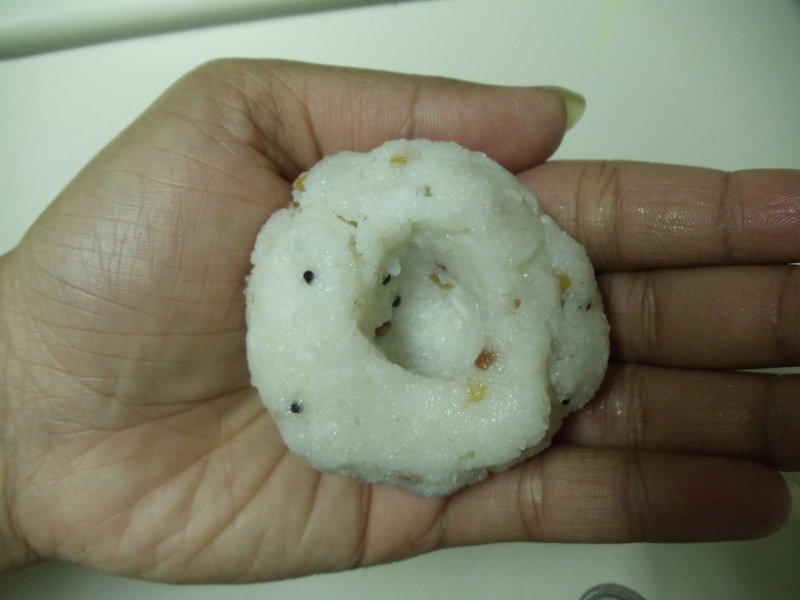 South Canara people use so much of coconut that it’s very hard to find a dish without coconut in it. You needn’t plan in advance to make this dosa batter because it doesn’t require any fermentation. Now let’s see how to make Panpolo or Neeru dose. Soak the rice for two hours. Then grind it along with coconut and salt. Add little water. Make it a fine paste. 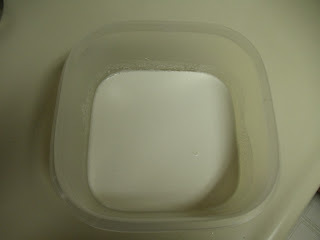 Transfer it into a bowl and water (around 1 cup). Mix it. The batter should be watery. 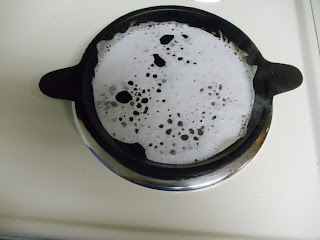 Don’t add too much water in the beginning itself. Make one dosa and if you feel it is thick then add little more water. You will get an idea as you make it. 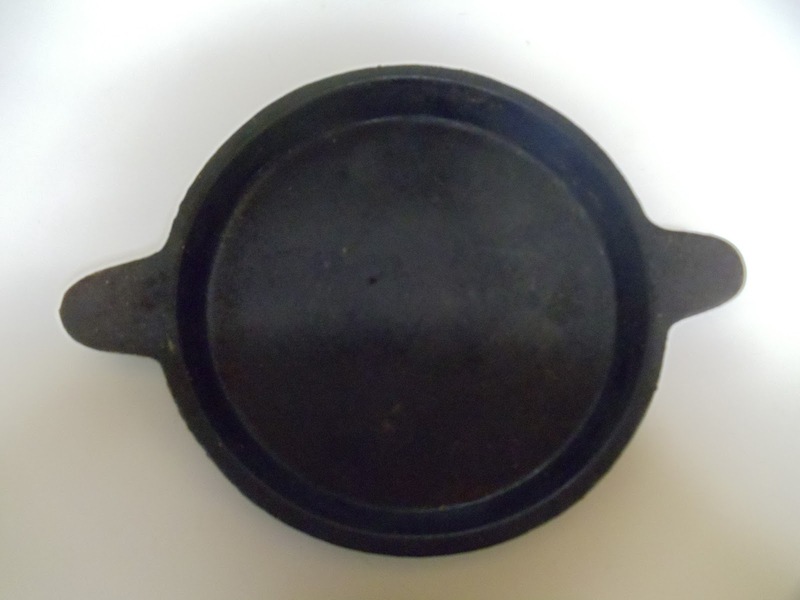 After the tawa gets heated, apply oil on the surface and pour the batter on the tawa till it covers the surface. Don't worry if the whole surface of tawa is not covered. Close it with lid and leave for a minute. Panpolo is ready! 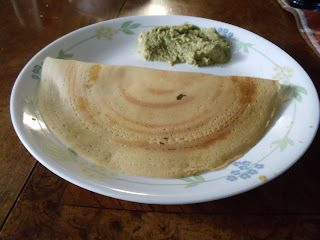 Dosa can be served with any spicy curry or chutney of your choice. A good combination would be panpolo and batate song. 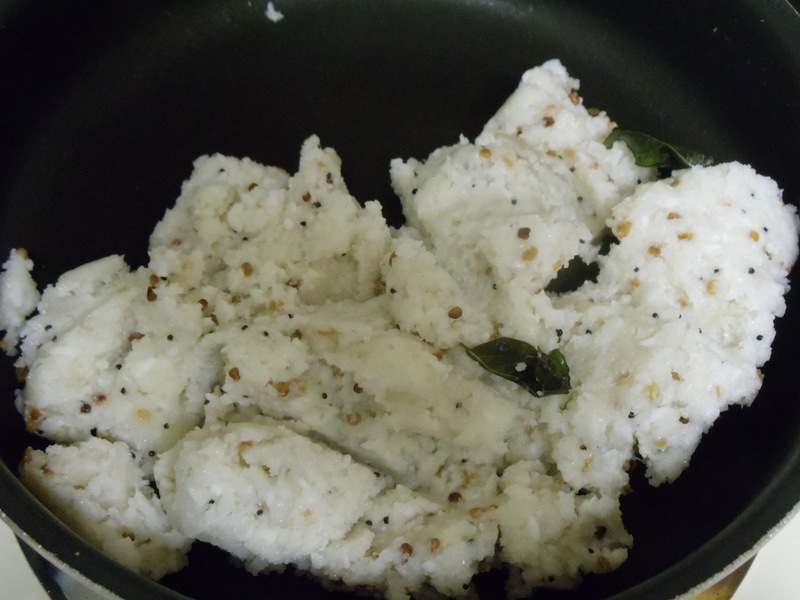 I love to have this with losne chutney (garlic chutney). My father likes it with home made butter. 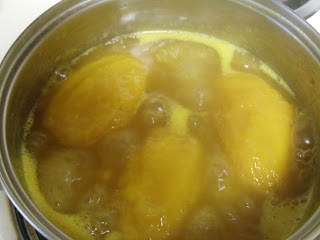 Another traditional combination is to have it with Choornu (mixing coconut + jaggery + cardamom). Some people like to have it with honey, pickle…. In this way there are many combinations. Note: Above measurement is for serving 3-4 people. I have also heard other versions of Neeru dose. Rice+ coconut+salt. Temper the batter with oil+ mustard+ cumin/ jeera. Also add cilantro/coriander leaves. Rice+ coconut+ dry red chillies+ salt. Add chopped onions. Chane gashi always reminds me of the Venkataramana temple in Udupi where it was served as prasadam on many occasions. 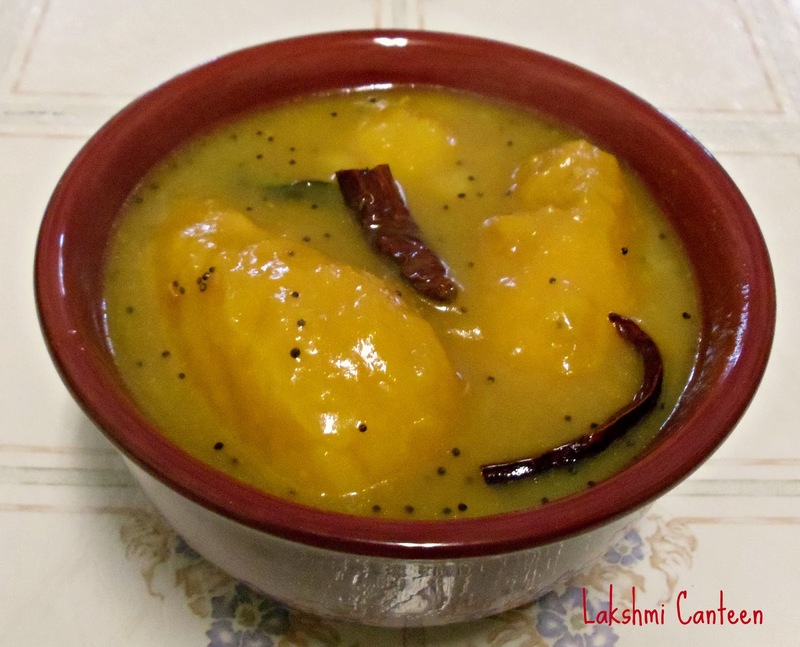 This dish is usually prepared on special occasions like wedding function, festivals etc because onions and garlic are not supposed to be used on that day. 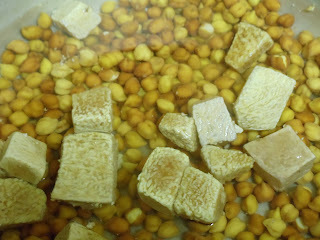 Tender jackfruit is an excellent combination with chana and I just love it. I always prefer Tender jackfruit in this dish. Since it is seasonal and hard to get, I go for Suran (yam) or potatoes. 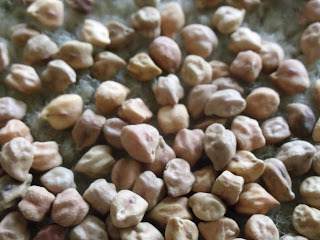 There are broadly two types of Chana - one is black and the other is white (Kabul Chana). The white chana is slightly bigger when compared to the blacker one. But apparently it’s found that black chana is much healthier when compared to white. This is because of the high fiber content in the black chana. It’s always better to use dried chana instead of the canned ones. It’s not good to use canned chick peas regularly because it has high sodium content. Soak Chana for 6-8 hours. 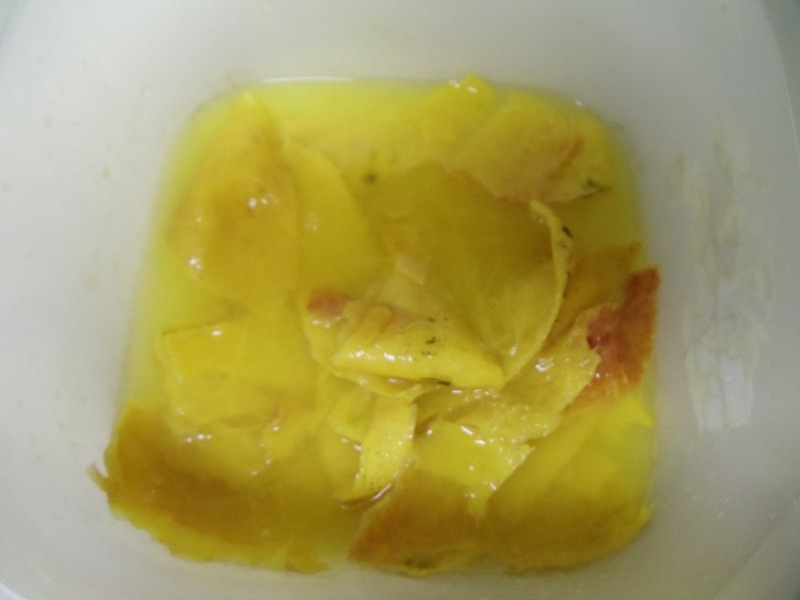 Cut tender jackfruit/Suran/potatoes into medium pieces. I used frozen Suran. 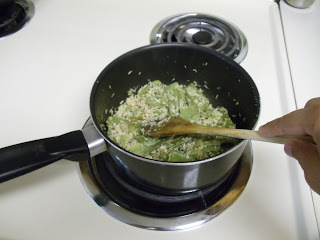 Then cook the soaked chanas along with the vegetable in a cooker with sufficient water. Also add salt to taste. Salt should be added during the process of cooking. 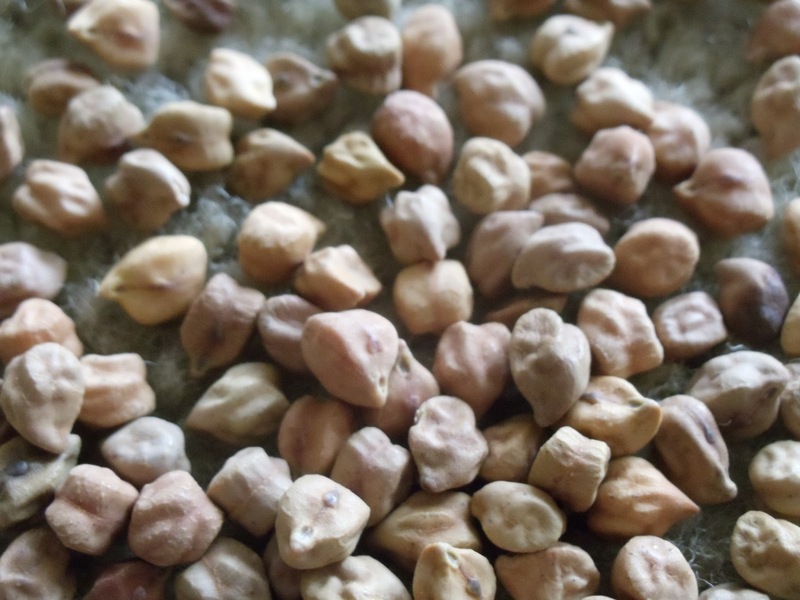 Chana will not absorb salt, once it is cooked. 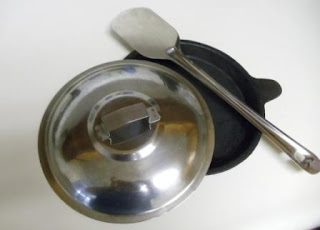 Four whistles are enough to cook the chanas. 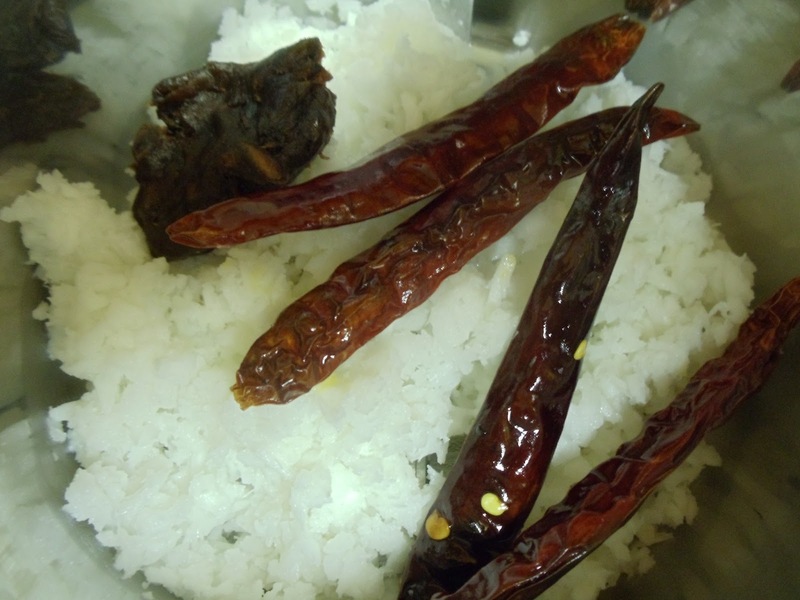 To prepare the masala - grind the coconut along with red chillies and tamarind. Add little water while grinding. Now add this masala to the cooked chanas and bring it to a boil. Add water if required. Consistency of the gravy should be not too thick or watery. Once it starts boiling, cook it further for 5-7 minutes until the rawness of the masala goes off. Turn off the heat. For tempering/seasoning - heat the oil and then add mustard seeds. 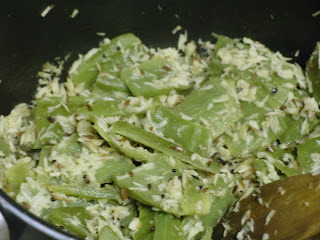 Once it starts spluttering, add cumin/jeera and fry it for few seconds and then add curry leaves. Add this to the Curry. Mix well. This dish goes well with rice, rotis, dosa. Above measurement is for serving 3-4 people.